Bahrain (meaning two seas) is a nation comprised of more than 30 islands situated in the Persian Gulf. It was one of the first Gulf states to find oil and build refineries. Because Bahrain never reached heights of production to match Saudi Arabia or Kuwait, it has been forced to diversify its economy. Bahrain’s climate is humid year-round, despite the fact that it has only three inches of rainfall per year. When it does rain, it is usually in the winter time. 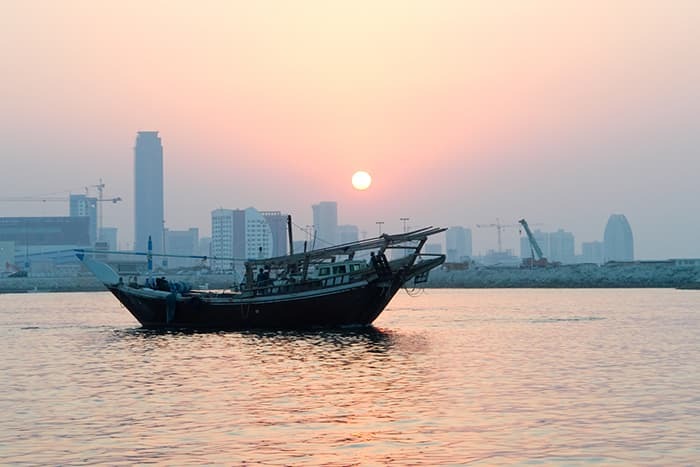 Although Bahrain is a desert country it is rich in flora and fauna and is home to more than two hundred species of plants as well as many animals like mongoose, hares, gazelles, and desert rats. The majority of Bahrain’s residents are Arabs. There are also many temporary immigrant workers throughout the country. Nineteen percent of the population is Asian. Interestingly, one-third of the country is younger than fifteen years old. Arabic is Bahrain’s official language, though English is widely understood. Urdu and Farsi are also commonly spoken. In ancient times, (around 200-BC), Bahrain was known as Dilmun. At this time, it was known as a popular trading post between the Indus Valley and Sumeri. By the fourth century C.E., Bahrain had become part of the Sasanian Empire and remained so until the seventh century when it was conquered and ruled by Muslims, who controlled the area until the early sixteenth century. Portugal took control of the region in 1521, using it as a military garrison and pearling post. The country was taken by the Persians in 1602, but this situation lasted only until 1783 when Ahmad ibn Al Khalifah gained control. His descendants lead Bahrain to this day. Because only one percent of the land in Bahrain is arable, the country cannot produce enough food for its population and must rely on imports. The economy is based primarily on the production and processing of petroleum. The country’s main sectors of employment are industry, services, and commerce. As well as food, other imports include transportation equipment and machinery. Affordability: Bahrain virtual numbers allow you to easily expand into new markets without having to invest large sums of money. Efficiency: With Bahrain virtual numbers you can offer your international clients a local presence without the inconvenience or expense of having to relocate. Seamless process: As well as Bahrain virtual numbers, you can get virtual international numbers in more than 140 countries from Global Call Forwarding. Convenience: Incoming calls can be directed to any number at any time of day. You can even choose to have calls from your Bahrain virtual numbers sent to multiple numbers at the same time until someone picks up. Great image: Bahrain virtual numbers boost your brand by giving you a local presence in Bahrain. How do Bahrain virtual numbers work? All you have to do is choose your international virtual number. You then link up the number to your existing mobile device or phone line. Customers dial your Bahrain virtual number, which to them, appears as a local or toll free number. The call is then redirected to your chosen number or numbers, and you can answer it on any device. How can I get Bahrain virtual numbers? Call our team at Global Call Forwarding and we will help you choose virtual international numbers for the countries you require. We will also show you how to customize and manage your numbers using our online interface. If you’re still not certain that international virtual numbers are right for your business, then we will hook you up with a free trial so you can see first-hand. How long will it take me to get my Bahrain virtual numbers activated? In most cases, activating your virtual international phone number takes only a few minutes. In some cases, with different countries, it may take a little longer. Can I pick specific city codes for my Bahrain virtual numbers? Absolutely. You can choose whichever city codes you need. Can I have more than one international virtual number? You can have as many virtual numbers as you need for locations in more than 140 different countries. Why not see for yourself just how beneficial international virtual numbers can be for your business? Contact our expert team at Global Call Forwarding today. We can answer all of your questions and show you how to customize your international calling service by using our online interface. Don’t forget to ask us for a free trial. We look forward to helping you expand your business overseas.